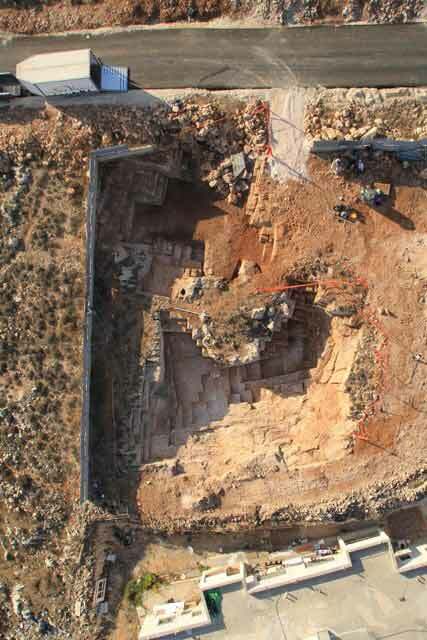 In October 2012, a salvage excavation was conducted in the Jerusalem neighborhood of Beit Hanina in (Permit No. A-6574; map ref. 63775–8/22096–8; Fig. 1), prior to private construction. 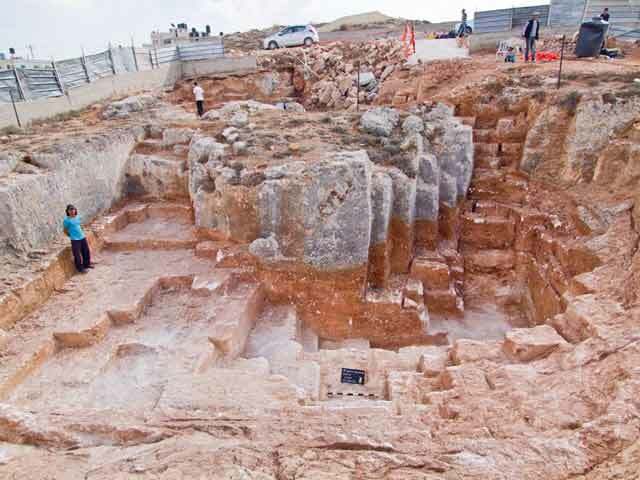 The excavation, undertaken on behalf of the Israel Antiquities Authority and financed by Mohammed Dohman and Partners, was directed by Z. ‘Adawi, with assistance from N. Nahama, R. Abu Halaf and N. Sanduka (administration), A. Hajian and M. Kunin (surveying and drafting), A. Peretz (field photography), the Sky View Company (aerial photography) and S. al-‘Amlah (metal detection). 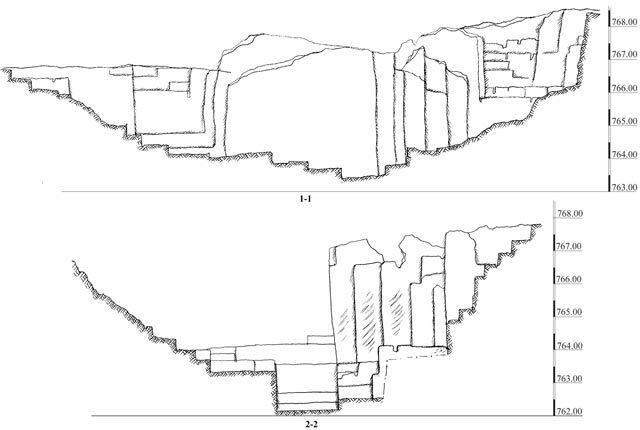 Two ancient quarries situated one alongside the other (A, B; Figs. 2–4) were exposed on a hill north of ‘Abed al-Hamid Shuman Street. 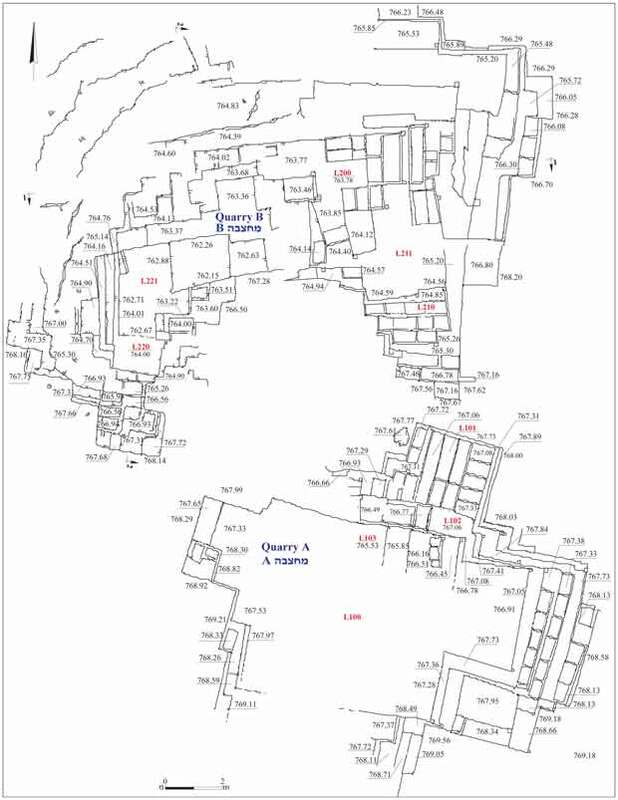 Dozens of quarries are spread across the hill; some have been surveyed and excavated, and they date mainly to the Roman and Byzantine periods (Mizrachi 2008a [Fig. 1:1]; Mizrachi 2008b [Fig. 1:2]; ‘Adawi 2009 [fig. 1:3]; Zilberbod 2013 [Fig. 1:4]). Many similar quarries stretch across a nearby hill, south of ‘Abed al-Hamid Shuman Street (‘Adawi 2007 [Fig. 1:5]; Zilberbod 2012a [Fig. 1:6]; Zilberbod 2012b [Fig. 1:7] Permit No. A-6324 [Fig. 1:8]). 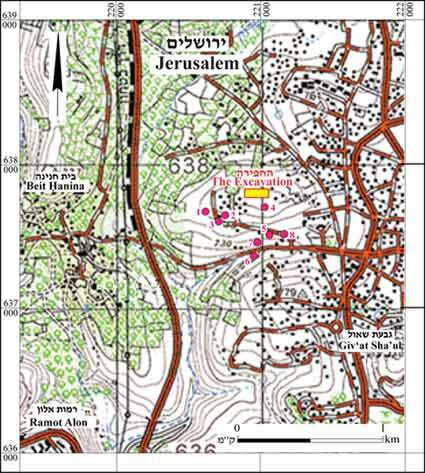 The quarries in the vicinity are situated in close proximity to two main Roman roads — the lateral road running between Jerusalem and Lod (the Bet Horon Road) and the longitudinal road from Jerusalem to Nablus (the Nablus Road) — which intersect at Milestone IV at Khirbat Hawanit (Kloner 2003:37; ‘Adawi 2012). The proximity of the quarries to the main roads apparently allowed easy transportation of the hewn stones to Jerusalem and other destinations. 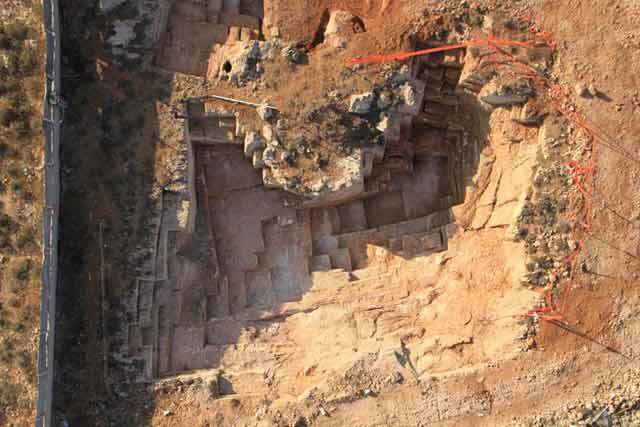 The two quarries that were exposed are medium-sized ‘courtyard quarries’ (Safrai and Sasson 2001:4–5). The quarries are terraced, and their bedrock walls are perpendicular. 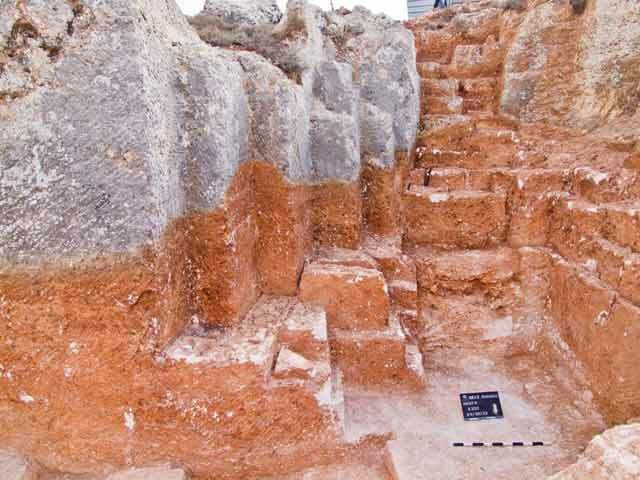 Three layers of fill were found in both quarries; the two upper layers were excavated by means of mechanical equipment. Brown alluvium mixed with quarrying debris from the nineteenth or twentieth century CE was discovered in the upper layer (L100, L101, L200; thickness 0.6–0.8 m). Additional evidence of modern quarrying are the compressor-made drillings (diam. 2–3 cm) that are visible in the bedrock walls of the quarry; explosives were inserted into such drillings. Alluvium and brown quarrying debris were discovered in the middle layer (L102, L210, L220; thickness 0.3–0.5 m). Quarrying debris consisting mainly white stone chips was discovered in the lowest layer, (L103, L211, L221; thickness 0.15–0.40 m); this debris proves that the final dressing of the hewn stones was done on site. Quarry A (at least 10 × 13 m; Fig. 5). Most of the outline of the quarry was discovered in the excavation; however, the excavation did not reach the bottom of the quarry. Exposed in the quarry was evidence of stone cutting: severance channels and several stones that were not detached from the bedrock (Figs. 6, 7), indicating that stones of various sizes were hewn there (0.3 × 0.3 × 0.5 m; 0.3 × 0.3 × 0.7 m; 0.30 × 0.40 × 0.55 m). Quarry B (c. 15 × 20 m; Figs. 8, 9). The excavation in this area reached the bottom of the quarry (depth c. 4 m). The great depth of the quarry shows that the rock-cutting was well planned and that the hard bedrock was fully exploited until soft chalkwas reached (Gorzalczany 2007). Severance channels and several stones that were not detached from the bedrock (Figs. 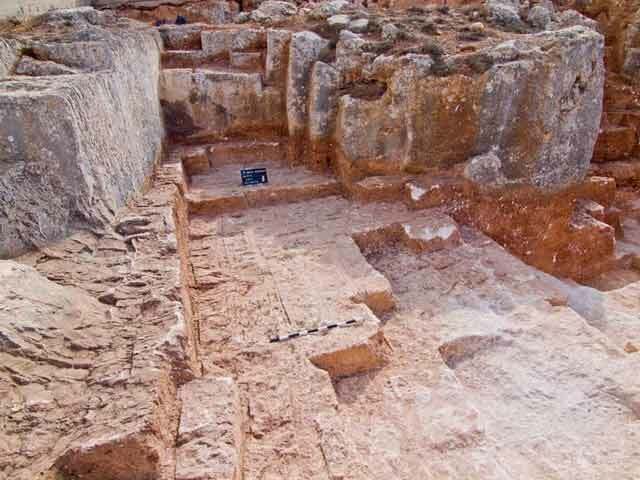 10, 11) indicate that the place was used for rock-cutting and that a variety of stone sizes were hewn there (0.3 × 0.3 × 0.5 m; 0.3 × 0.3 × 0.7 m; 0.3 × 0.4 × 0.6 m; 0.4 × 0.5 × 0.7 m). 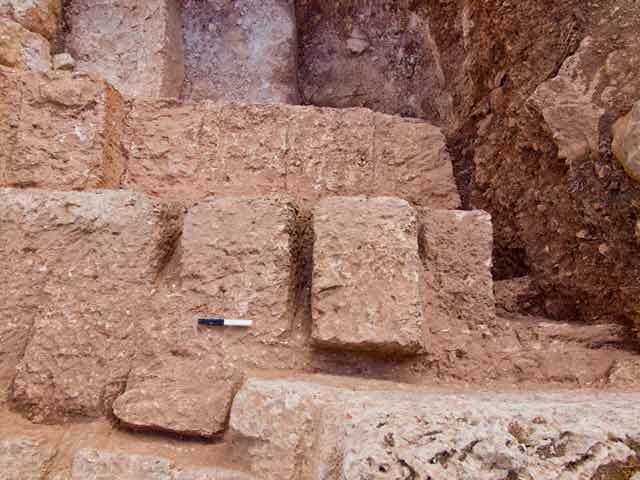 No artifacts were discovered in the quarries at the site; however, as similar, nearby quarries have been dated to the Roman and Byzantine periods, and possibly also to the Early Islamic period (Mizrachi 2008b), it can be assumed that time period applies to the quarries exposed in this excavation. 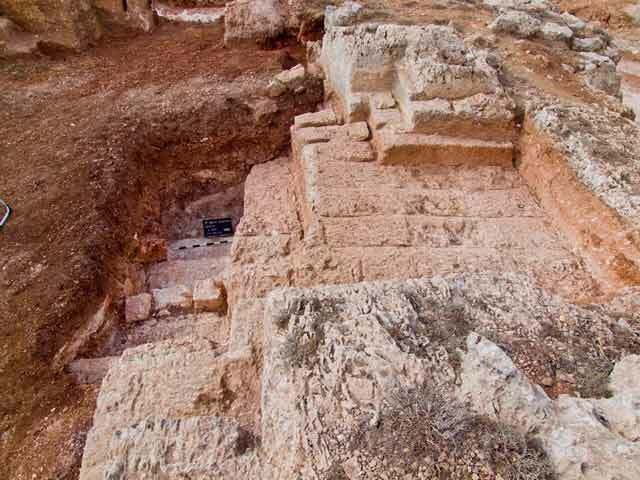 These quarries belong to a group of quarries that were discovered throughout Jerusalem, which were intended to supply building stones for the city and sites in the city’s hinterland, such as Khirbat Hawanit and Khirbat ‘Addasa. ‘Adawi Z. 2012. Jerusalem, Beit Hanina. HA-ESI 124 (Dec. 31). Gorzalczany A. 2007. Stone Quarries at Horbat Gilan, in the Menashe Hills. ‘Atiqot 55:37–44 (Hebrew; English summary, pp. 55–56). Safrai Z. and Sasson A. 2001. Quarrying and Quarries in the Land of Israel. Elkana (Hebrew). Zilberbod I. 2012a. Jerusalem, Beit Hanina. HA-ESI 124. Zilberbod I. 2012b. Jerusalem, Beit Hanina. HA-ESI 124. 4. 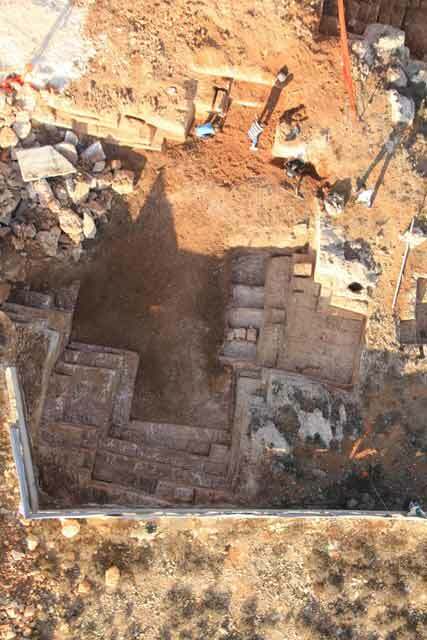 The excavation area, aerial view looking south. 5. Quarry A, aerial view looking west. 6. Quarry A, signs of quarrying and stones that were not detached from the bedrock, looking west. 7. Quarry A, stones that were not detached from the bedrock, looking south. 8. Quarry B, aerial view looking south. 9. Quarry B, looking south. 10. Quarry B, signs of stone quarrying, looking south. 11. Quarry B, signs of stone quarrying, looking south.